Animal Friends is inviting everyone to spend a hot Rijeka summer day trying something new and different while discovering interesting and useful nutrition and diet information. Refreshment and relaxation guaranteed! 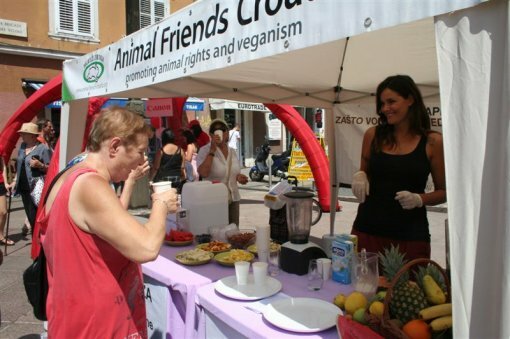 To help citizens better stand the summer heat and get the public informed about ways they can help animals, Animal Friends is organizing a tabling and tasting for citizens on Friday, August 3, 2012 at 12 noon on Korzo in Rijeka. The info stall will be also held on Saturday, August 4, 2012. 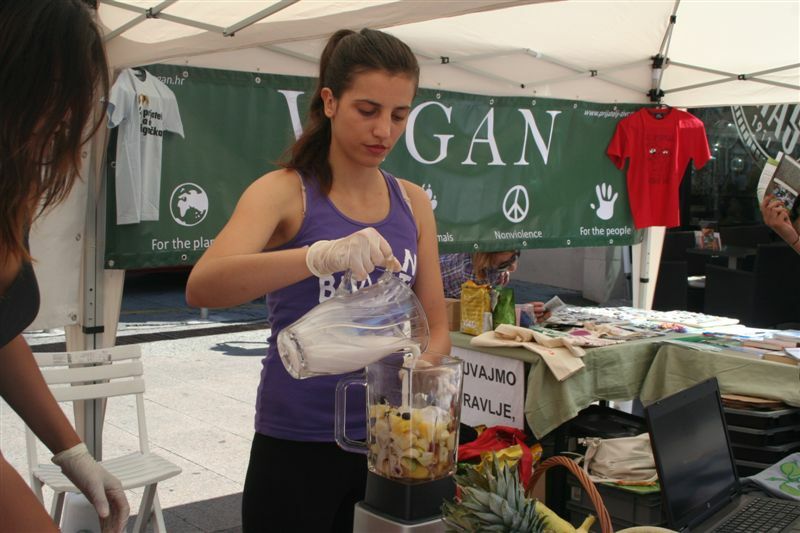 In Rijeka's oasis in the city's center, citizens will be able to refresh and enjoy juicy fruit and plant-based smoothies made with soy and almond milk and sweetened with agave syrup. Attendees will also receive information on how to easily make almond milk at home and be able to view a demonstration of this process through a funny video. 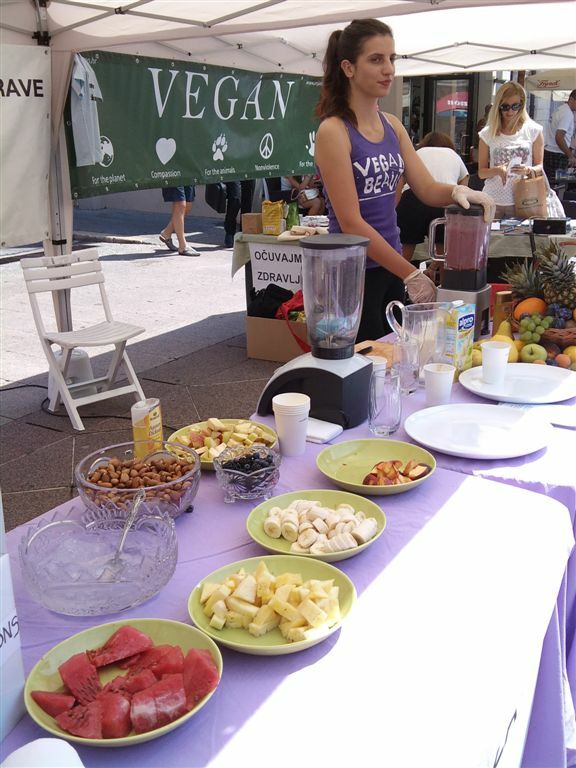 Animal Friends volunteers will also be handing out smoothie, ice cream, and cold vegan dessert recipes as well as other informative materials to the public. In addition, attendees will receive information on how they can help animals through simple, everyday involvement and be able to sign a petition that aims to introduce vegetarian meals in public institutions. 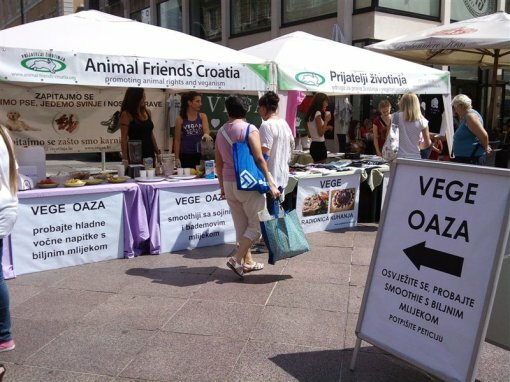 With this event, Animal Friends will also announce its fifth annual ZeGeVege Festival of Sustainable Living, which will be held on September 7-8, 2012 at Trg bana Jelacica. ZeGeVege Festival promotes sustainable living and offers a rich variety of activities to attendees, continually attracting more and more visitors every year. Part of this unique entertainment and educational festival is the Green Monday campaign which encourages people to eat foods of plant-based origin at least one day a week in order to improve their health and the environment. The web site www.zeleni-ponedjeljak.com offers info list subscribers weekly recipes of healthy and tasty meals through e-mail that are perfect for Green Monday. Besides being delicious, plant-based milk has many health advantages over cow's milk. It contains no cholesterol or lactose like cow's milk, which many people cannot digest, and has fewer calories, carbohydrates, and fat. While cow's milk and other foods of animal origin are high in protein and increase the risk of osteoporosis by releasing calcium from bones, plant-based milk enriched with calcium contributes to bone strength. In addition, plant-based milk is made without exploiting animals. All citizens who do not have the opportunity to come to Veggie Oasis can find seasonal summer recipes for refreshing drinks, cold veggie sweets, and other veggie dishes, together with information about cooking workshops and an online petition for the introduction of vegetarian meals into public institutions at our web site. And video footage about how to make almond milk can be viewed here.